Bridge Builders of Anchorage and the Polynesian Association of Alaska invite you to join them for a Spring Tea to celebrate the season, meet old friends, and make new connections while enjoying delicious finger sandwiches and sweet treats. The Simorgh Dance Collective invites all to the Colors of Persia, an evening celebrating Persian culture with dance, music, and food. The performances include the Simorgh Dance Collective and Farima Berenji of Farima Dance. 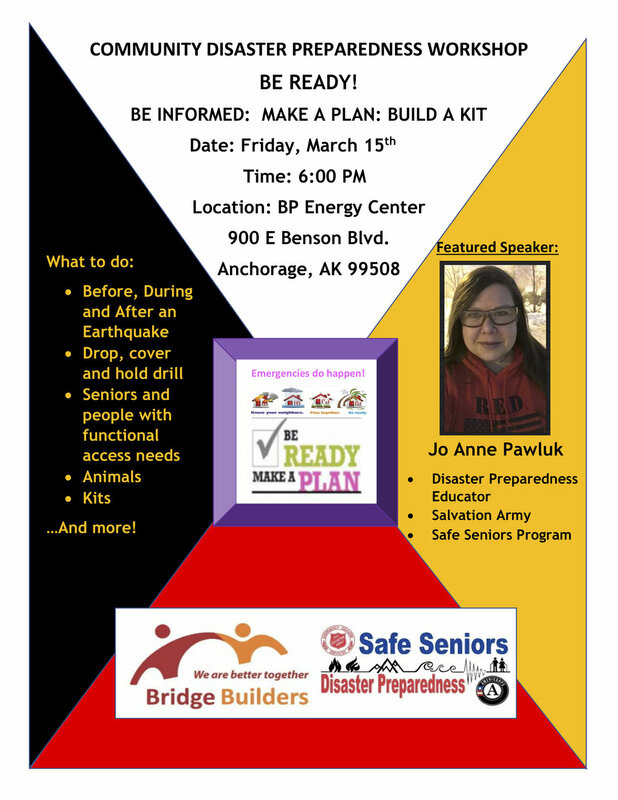 Bridge Builders of Anchorage, the Salvation Army, and Americorps invite you to “Be Ready, Be Informed, Make a Plan, and Build a Kit!” Jo Anne Pawluk, a Disaster Preparedness and Safe Seniors Program educator will be the featured presenter. Together let’s learn what to do before, during, and after an earthquake, what precautions seniors and people with functional access needs should take, how to care for our animals, and what should go in our kits. Keys to Life, the Kumin Foundation, and the Alaska State Council on the Arts invite you to listen and learn at Once Upon A Culture… Festival of Stories. During this year’s Festival, storytellers of different cultures will cast the spell of their stories on the audience. The 2019 Festival will highlight cultural bearers who bequeath knowledge and wisdom, i.e. the hanashikas, Japanese comedians who tell daily life stories reinforcing behavioral codes; or the griots, African knowledge keepers who sing their stories. During the festival, facilitators will reflect on the artistic languages that stories take in different cultures, i.e, Turkish, Persian, Somali, Mexican, Japanese, Filipino, Alaska Native, Korean, Indian, and African-American. An exciting new element for this year’s festival will be youth-organized workshops. Young people will use stories and poetry to explore the impact of drugs and bullying in their peer groups. Bridge Builders of Anchorage proudly invite you to our annual flagship event, Meet the World! This special event includes an opportunity to meet our neighbors and celebrate the diversity that makes Anchorage such a wonderful place to live. There will be cultural and community tables, with lively cultural entertainment, traditional attire, a Parade of Nations, and an International marketplace. For details on tabling or performing, please see the Forms page. Anchorage Lutheran Concert Series presents nationally and internationally known Balalaika Duo, Mikhail Smirnov and Dr. Elina Karokhina. This exciting evening of music will include Russian traditional and popular music as well as Ukrainian, Gypsy, Jewish, classical, and other surprises. The Japanese American Citizens League, Alaska Chapter invite you to the 2019 Day of Remembrance. From February 19th through March 2nd is a photo exhibit in remembrance of Chiune Sugihara, the Japanese Vice Consul to Lithuania who issued thousands of lifesaving transit visas to Jewish refugees during WWII. There will be an opening night program with a special screening of the 2017 documentary short film Sugihara Survivors: Jewish and Japanese, Past and Future, a presentation by film director Junichi Kajioka, and representatives from the Anchorage Japanese and Jewish communities. Contributors to this event include the Japanese American Citizens League, Alaska Chapter, UAA Montgomery Dickson Center for Japanese Language & Culture, Municipality of Anchorage, Z.J. Loussac Library, Alaska Jewish Museum, Congregation Beth Sholom, TOTE Maritime, Consular Office of Japan in Anchorage, Japanese American Citizens League Legacy Fund, Anchorage Unitarian Universalist Fellowship, and United Jewish Communities. Sankofa Dance Theatre Alaska invites you to celebrate the road to emancipation. We will reflect on the past and honor the journey of African-Americans course to freedom through dance, drumming, song & spoken word. Doors open at 2:30PM and in the atrium there will be light hors d'oeuvres and an oral history of Juneteenth. Special Performances include: Dawn McClainAsenati, MMA -Mostly Melanin Arts, East High Dance Contempo, West High DanceWest, Black Arts North Academy, Trey Josey, David Coleman, Underground Dance Company, and Sankofa Dance Theatre Alaska and the Oni Ilu Drum Core. Keys to Life invite you to join us for an amazing event. Stories from the recently published Eyes Closed book will come alive when local celebrities read them, reminding us about the power of dreams! Children featured in the stories will share the stage and pose questions to the Celebrity Readers, creating an intergenerational dialogue about dreams. The dAXunhyuuga' Eyak Revitalization Project invite you to save the date for a weekend open to all marking the 2019 Winter Eyak Language and Cultural Workshop. Including a screening of the film “On the Tip of the Tongue” by filmmaker Vincent Bonnay. Bridge Builders of Anchorage along with the Eyak Cultural Foundation, Applied Archaeology International, Z.J. Loussac Library, Native Village of Eyak, The Eyak corporation, The Cordova Center, The Cordova Iceworm Festival, and the Alaska Native Revitalization Digest invite you to an afternoon screening of the film, Sur Le Bout De La Langue. This documentary by Vincent Bonnay is an official selection of the 2018 Anchorage International Film Festival. Come and join us in support of the Eyak Language Revitalization efforts! There will be a Q & A to follow. The Polynesian Association of Alaska invites you to a Valentine Bash, celebrating and honoring 10 amazing Pacific Island adults who have made a difference in Anchorage through their volunteering efforts. There will be dinner, door prizes, music, a silent auction, and performances by Pacific Bloom. The Bartlett High School Chinese Language students invite you to join in celebrating the special festival of Chinese New Year. There will be performances, treats, and good wishes for the new year! The Alaska Center for Spiritual Living invite all to experience the spoken word, songs, meditation, contemplation, candle lighting, and prayers for peace during this event marking the beginning of the Season for Peace (January 30th through April 4th). The Season’s purpose is to focus on education and the philosophy of attaining peace through nonviolent actions as demonstrated by Mahatma Gandhi and Dr. Martin Luther King Jr. The Municipality of Anchorage, The NAACP, UAA, The Alaska Center, Anchorage Public Library, and the Quakers invite you to an Anchorage Climate Action Plan Vision Workshop. Come and welcome special guest Jacqui Patterson, who is the NAACP Environmental and Climate Justice Director, and share your ideas for improving transportation, accessing local healthy foods, saving money on utility bills and energy saving, healthy communities, and energy smart buildings. Dinner will be provided to participants along with child care and interpretation services as needed. Please contact ClimateActionPlan@anchorageak.gov or call (907) 343-7170 to request an interpreter or other accommodations at least 72 hours in advance. Find the event on Facebook and RSVP! Craft of Alaska invites you to an evening of laughter, dancing with live music by the Big Block Chevy rock band, prizes, and a Russian-American buffet. This is a BYOB event (bring your own bottle) - leave your superstition behind and feel the power of lucky number 13! The Polynesian Association of Alaska and Providence Health Services Alaska are sponsoring a free health fair for a stronger and healthier community. There will be health information and screenings, gently used clothing for children and adults, and delicious refreshments. 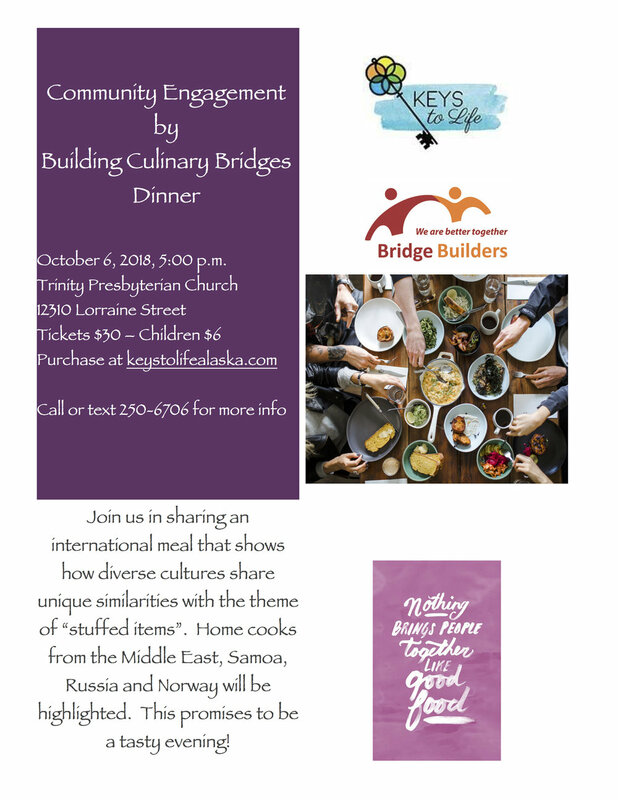 POSTPONED DUE TO EARTHQUAKE ON 11/30 - STAY TUNED Bridge Builders of Anchorage cordially invite you to our Annual International Potluck. We come together as a community of friends to share favorite traditional foods, to make new friends, and to renew relationships. We welcome all cultures, races, ethnic backgrounds, and faith traditions. We will introduce the Bridge Builders’ Board of Directors, engage in lively conversation, eat delicious foods, and plan for the upcoming year of Bridge Builders’ activities. We invite you to complete an application that will add you to our definitive list of members. Please bring 6-8 servings of your favorite traditional dish to share with a description of the dish and a list of ingredients to help those with food allergies or dietary restrictions. The Interfaith Council of Anchorage invites you to a wonderful time to celebrate all faiths and communities with their annual interfaith gathering. In this spirit, all are welcome. A reception with light refreshments will follow after the program. Keys to Life, the Rasmuson Foundation, Atwood Foundation, the Alaska Children’s Trust, Frances and David Rose, At. Mary’s Bazaar, and the Shelley Al and Shelley Biss family, invite you to a moving concert experience with original music, inspiring and empowering incarcerated mothers and fathers, in partnership with Carnegie Hall Weill Music Institute. Please join UAA and APU in their joint initiative Difficult Dialogues and Book of the Year program whose theme is community resilience, in welcoming indigenous author, activist, economist, and environmentalist Winona LaDuke to Alaska. There will be a series of events and discussions that are free and open to the public. The Anchorage Health Kick Festival 2018 is a fun and exciting fundraising event to help support our local foster kids and the work done by the Alaska Center for Resource Families. There will be a world class martial arts demonstration, a breakathon, silent auction, entertainment & educational carnival, face painting, games, and multicultural performances. This event is family oriented and great for all ages. This retro themed evening of dance is a fundraising event for the Marharlika Scholarship of Excellence Award. Community volunteers including Bridge Builders of Anchorage, the Anchorage Community Land Trust, Be SMART, Moms Demand Action, and Fairview residents invite you to the first ever Fairview Community Trunk-or-Treat, a fun and inclusive way for children, teens, and all types of families to celebrate Halloween. The festivities will include trick-or-treating from car to car, games, Halloween stories, and warm drinks. The Alaska Highway Project invites you to a reader’s theatre play celebrating the soldiers who built the Alaska Highway in 1942. This free performance will be held on African-American Soldiers Contribution to Building the Alaska Highway Day and features a dramatic reading in the soldiers own words or in the words of their loved ones. The Russian Cultural Center in Alaska invites you to attend the Grand Opening Night - an evening of music by Verdi, Puccini, Bizet, Saint-Saëns, Tchaikovsky, Dvorák, and Lehár featuring the Akamerata String Quartet, soprano Zoya Gramagin, tenor Mikhail Urusov, and Tamara McCoy on piano. Please join in celebrating Filipino American History Month, commemorating the 120th Anniversary of Philippine Independence from Spain and marking the 50th Anniversary of the establishment of Ethnic Studies. This special day will feature special guest Professor Daniel Phil Gonzales from San Francisco State University, as well as entertainment and delicious food. The Alaska Native Media Group, Alaska Native Tribal Health Consortium, and Best Beginnings invite you to the First Annual Alaska Native Book Fair, celebrating and encouraging reading, writing, and creativity. There will be more than 20 Alaska Native published authors and illustrators signing and selling their books as well as publishers, distributors, and experts in writing for children. Update: POSTPONED, stay tuned for more details. CRAFT of Alaska invite you to enjoy Russian food, entertainment, dancing, and a silent auction, celebrating the autumnal equinox. The Anchorage Public Library, Welcoming Anchorage, and the UAA Center for Community Engagement and Learning invite community members of all ages to attend the 2018 Civics Fair. Engage with your community and learn about over 20 local organizations in Anchorage.